Fennel is a hardy, perennial herb that grows up to three feet tall. It has delicate, feathery leaves and produces clusters of small, yellow flowers. It is indigenous to Europe and the Mediterranean. Throughout history, fennel has been used to treat a number of digestive ailments such as indigestion, heartburn, constipation, flatulence and bloating. Please consult your physician before attempting any herbal remedy at home. Fennel has a long history for flavoring food and for medicinal use. According to Botanical, early records show that fennel was cultivated by the Romans and used to ward off evil influences. It was also used to season fish. The ancient Greeks believed it could bestow courage and strength and a long and healthy life. Nowadays, many herbal practitioners recommend fennel for digestive disorders such as heartburn. Heartburn is a digestive disorder that causes discomfort and a burning sensation in the chest shortly after eating. According to MayoClinic.com, heartburn is caused when your esophageal sphincter – a small band of muscle around the base of the gullet – allows liquid food to reenter the esophagus from the stomach, causing a back-flow of stomach acid. According to Herbs 2000, fennel contains a large number of active constituents. It is the volatile oil, which is composed of the substances fenchone, trans-anethole, limonene and a-pinene, that is considered to be responsible for the herb’s soothing effects on the stomach and prevention of digestive disorders. The extracted oil is just as effective as the plant seeds. Fennel has a carminative effect, which means it can sooth the digestive tract and reduce acid and inflammation as well as gas and bloating. You can chew fennel seeds after a meal to aid digestion and prevent heartburn. 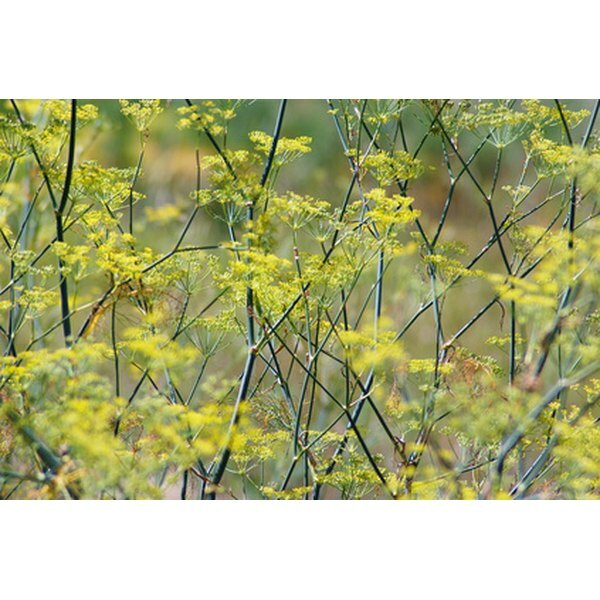 Fennel is also available in liquid extract or tincture. According to Vitamin Stuff, the recommended dosage is 1 tsp. of tincture to be taken three times each day, or 1/2 tsp. of liquid extract per day. According to Herbs 2000, fennel may cause the following side effects: contact dermatitis, hives, photo-dermatitis, nausea, vomiting and pulmonary edema. Pregnant and lactating women should not consume large amounts of fennel in their diet. People who are diabetic should avoid using fennel syrups due to their high sugar content. You should consult your physician before taking an herbal supplement.